Nonlinear methods provide a direct way of estimating complexity of one-dimensional sampled signals through calculation of Higuchi's fractal dimension (1<FD<2). In most cases the signal is treated as being characterized by one value of FD and consequently analyzed as one epoch or, if divided into more epochs, often only mean and standard deviation of epoch FD are calculated. If its complexity variation (or running fractal dimension), FD(t), is to be extracted, a moving window (epoch) approach is needed. However, due to low-pass filtering properties of moving windows, short epochs are preferred. Since Higuchi's method is based on consecutive reduction of signal sampling frequency, it is not suitable for estimating FD of very short epochs (N < 100 samples). 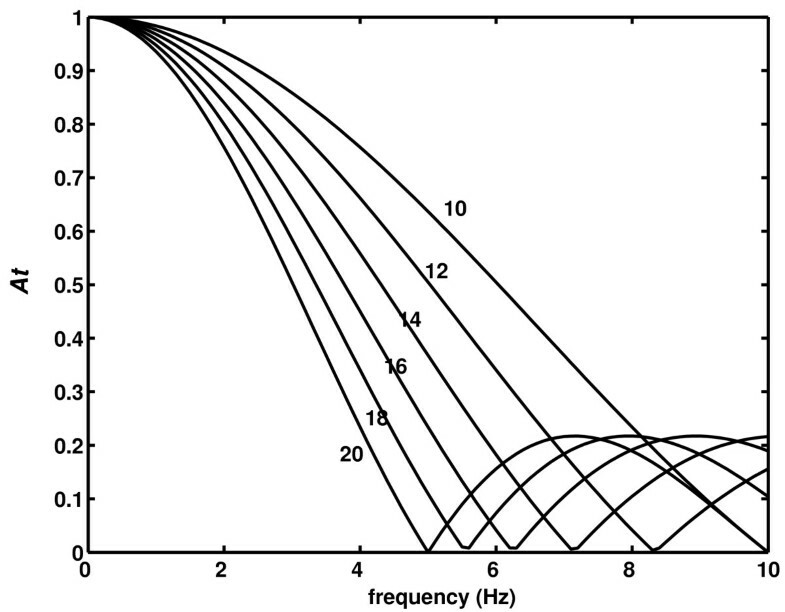 where y n (i) represents the ith signal sample after amplitude normalization. The actual calculation of signal FD is based on construction of a monotonic calibration curve, FD = f(NLD), on a set of Weierstrass functions, for which FD values are given theoretically. The two existing methods, Higuchi's and consecutive differences, applied simultaneously on signals with constant FD (white noise and Brownian motion), showed that standard deviation of calculated window FD (FD w ) increased sharply as the epoch became shorter. 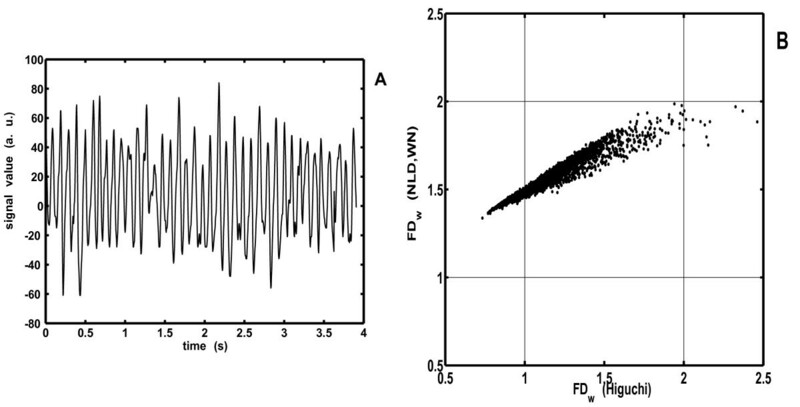 However, in case of the new NLD method a considerably lower scattering was obtained, especially for N < 30, at the expense of some lower accuracy in calculating average FD w . Consequently, more accurate reconstruction of FD waveforms was obtained when synthetic signals were analyzed, containig short alternating epochs of two or three different FD values. Additionally, scatter plots of FD w of an occipital human EEG signal for 10 sample epochs demontrated that Higuchi's estimations for some epochs exceeded the theoretical FD limits, while NLD-derived values did not. The presented approach was more accurate than the existing two methods in FD(t) extraction for very short epochs and could be used in physiological signals when FD is expected to change abruptly, such as short phasic phenomena or transient artefacts, as well as in other fields of science. Low-pass filtering properties of a series of moving windows. A t – amplitude attenuation; different lines correspond to different window lengths (N w = 10,12,...,20 samples); signal sampled at f s = 100 samples/s. where f s represents the sampling frequency, N w number of samples in the window. According to equation (2), in order to extract accurately the waveform Q(t), i.e. avoid the attenuation of as many Fourier components as possible, it is desirable to have large values of f c , according to (2) small values of N w (short windows) for a given sampling frequency. Importance and limitations of estimating nonlinear properties of biological (particularly EEG) signals for short epochs has already been recognized (cf. [1, 2]). Although these filtering properties were derived for oscillations (waveforms) of signal amplitudes, we showed in our previous work dealing with meteorological data (cf. [3, 4]) that they are also valid for oscillations of signal complexity, expressed quantitatively as "running fractal dimension" Q(t) = FD(t) (cf. ). we were able to calculate parameters A(n max ) and B(n max ) for n max = 3,...,7. In this method, the need to choose a value for k max is eliminated. More, introducing n max instead of k max did not mean substituting one indeterminacy with another, since the smallest numerical error, on the used set of Weierstrass function, was obtained with n max = 3. A. Linear dependence of normalized length density ( NLD ) on the local extrema density ( Led ) in the log-log scale. Data on each line were derived from 30000 short epochs with different lengths (o - 7; x - 6; Δ - 5; ◇ - 4 samples). Epochs consisted of randomly generated samples in the range (0,1). B. Distributions of number of generated epochs, N(NLD), by their NLD values, derived from the 30000 seven-sample epochs from panel A. Histograms differ in the number of local extrema detected on the epochs (N le ), and positions of their peaks correspond to ordinate values of circles on A. Relationship between theoretical fractal dimension ( FD ) of 3960 tested Weierstrass functions and their normalized length density ( NLD ). Forty thin black lines correspond to Weierstrass functions with forty fixed values of the intrinsic parameter γ, thick red line to their average. was calculated and presented as a thick red line on Fig. 3. As this and its inverse function FD = φ-1(NLD) = f(NLD) turned to be monotonous, the latter fulfilled the necessary condition to be used as a calibration curve in further calculations. power model: FD = a (NLD - NLD o ) k .
Nonlinear fitting was performed on the obtained points FD = f(NLD) (circles, Fig. 4) for both mathematical models. As can be seen, the power model showed better results (smaller square fitting error per point). A better matching of the power model to the experimental points could also be seen visually, especially for higher values of NLD and FD. Circles: fractal dimension ( FD ), as a function of normalized length density (NLD), obtained from a set of Weierstrass functions ( FD = 1.01 – 1.99; γ = 1.1 – 5.0). Solid line: nonlinear fitting with two mathematical models – logarithmic (A) and power (B). When extracting complexity waveforms from one-dimensional signals, a problem arises which is not present when conventional FD measurements are applied (averaging of window FD values for the whole signal). Namely, since in every natural signal both amplitude and complexity simultaneously vary, it is essential to eliminate, as much as possible, influence of amplitude variations on complexity measurements. Fortunately, Higuchi's method is invariant to amplitude variations. However, this is not the case when NLD analysis is performed. Two procedures are possible for signal amplitude normalization: a) to normalize signal amplitudes for the whole signal, by applying formulas (9) and (10) before the NLD procedure. Such a procedure is in accordance with the way the calibration curves, presented on Fig. 3 and Fig. 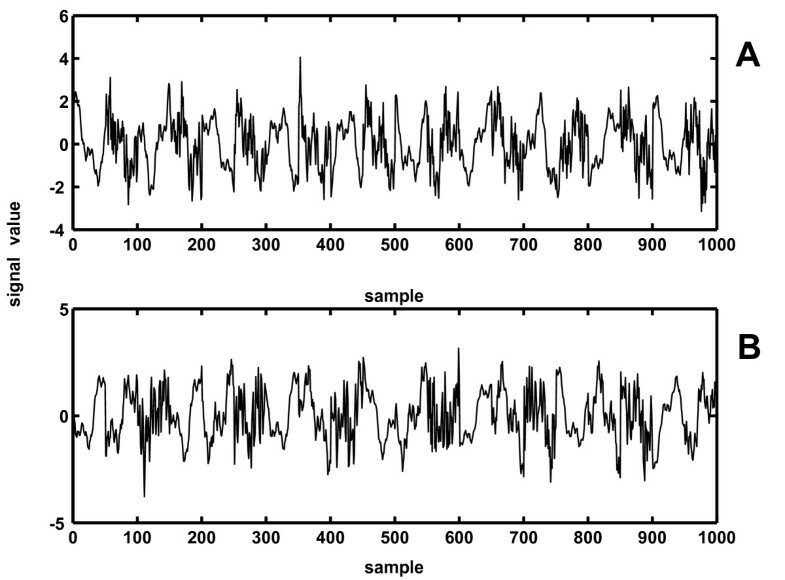 4B were obtained after amplitude normalization of the Weierstrass functions. However, this version (integral normalization, IN) is not entirely immune on signal amplitude variations that necessarily occur while the window of analysis moves along the signal. b) According to the other version of the method, amplitude normalization is to be performed on every part of the analyzed signal selected by the moving window (window normalization, WN). Each of these two versions of the NLD method showed more or less accurate results in extracting complexity waveforms for very short signal epochs, depending on the measurement conditions. Therefore, the problem of current signal amplitude variations and elimination of their influence on FD(t) is still to be elucidated in future studies. All natural signals are of variable complexity. Accuracy of any method for measuring FD could be estimated by scattering (standard deviation) of epoch (window) FD values, FD w , if signals with constant FD are being analyzed (such as white noise, FD = 2, and fractal Brownian motion, FD = 1.5). Standard deviation of all measured FD w increases with shortening of windows, causing numerical errors. We compared this scattering obtained by Higuchi's, consecutive differences and NLD method (power model version, WN) on these two types of noise (Fig. 5). Integral normalization was also performed, but since the results for mean(FD w ) obtained with IN version were less accurate than with WN, they are not presented. However, std(FD w ) obtained with IN version were also considerably smaller than those with Higuchi's or the CD method. As well, because more accurate results were obtained with power than with logarithmic model (lower fitting error on Fig. 4B), these and all following measurements were not performed with the logarithmic model. As expected, when the epoch shortened, std(FD w ) increased for all methods (Fig. 5B and 5D). 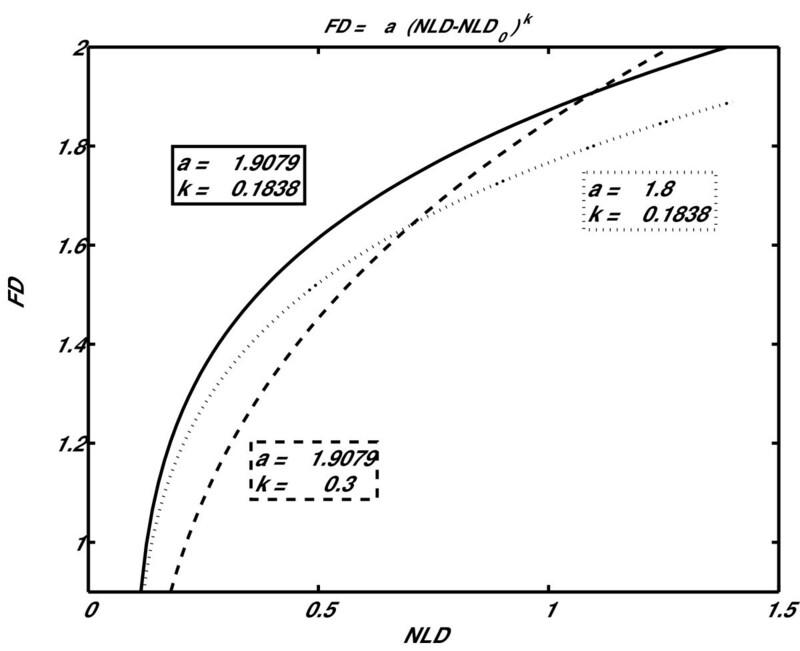 The new NLD method showed a significantly lower FD w scattering than Higuchi's or CD, especially for short epochs, reducing the numerical error. However, this improvement was obtained at the expense of an increased difference between mean FD w and the theoretical FD value (Fig. 5, upper panels, A and C). Fortunately, when extracting complexity waveforms from one-dimensional signals, it is more important to have lower scattering of window FD values than the preciseness of their mean value. The latter contributes merely to the "DC" level of the extracted complexity waveform, while the waveform quality (signal-to-noise ratio i.e. 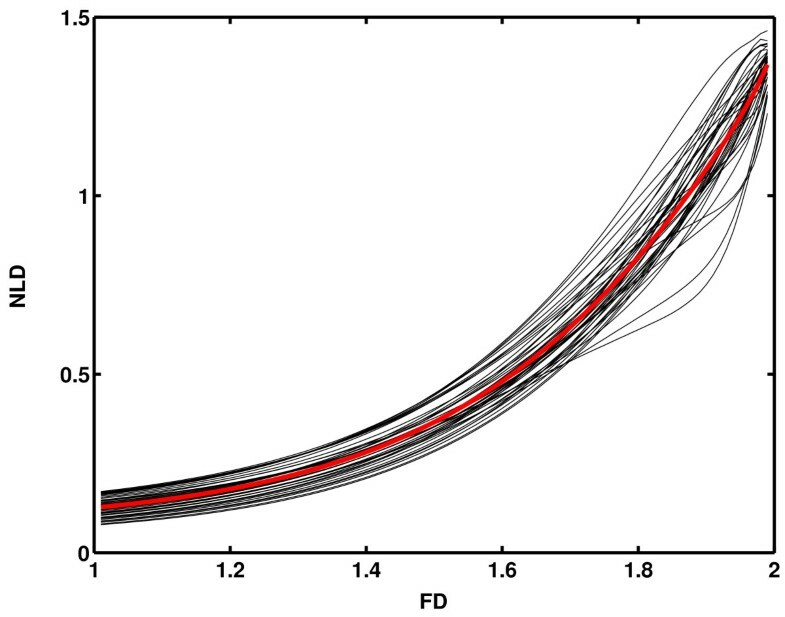 window-to-window fluctuations) depends heavily on the standard deviation of the FD w values. This statement will be illustrated on several examples. Mean (A, C) and standard deviation (B, D) of window fractal dimension ( FD w ) values, obtained by analyzing white noise (A, B) and Brownian motion (C, D) with Higuchi's (green, *), consecutive differences (black, o) and the power model version (WN) of the NLD method (red, Δ). In order to compare the new method with Higuchi's when dynamical change of signal FD occurs, two synthetic signals were constructed from different Weierstrass functions: one consisted of a series of 50 sample epochs, having two alternating FD values: 1.2 and 1.8 (Fig. 6A), while the other was formed by composing three FD values: 1.1, 1.5 and 1.9 (Fig. 6B). Both signals had γ = 3.4 and were 1000 samples long. This particular value for parameter γ was chosen because its corresponding calibration curve (one of the black lines on Fig. 3) was positioned closest to the average calibration curve (red line on Fig. 3), minimizing the induced systematic error (optimal "DC" level of FD(t) on Fig. 7A, C). 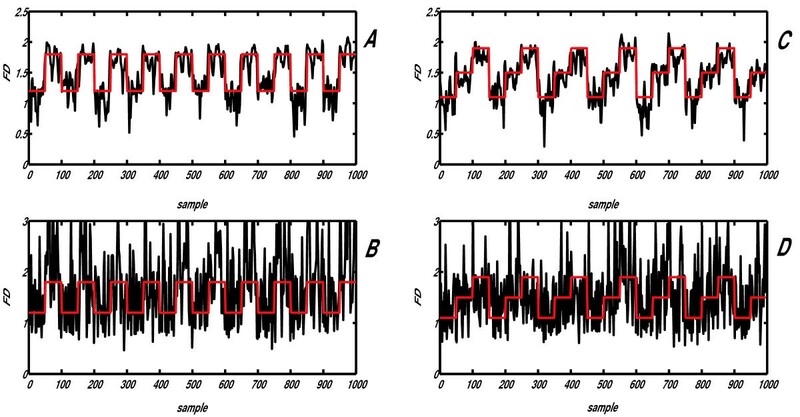 Prior to further processing, each 50 sample epoch underwent amplitude normalization according to expressions (9) and (10), in order to eliminate influence of amplitude differences of componential Weierstrass functions on FD(t) extraction. Two synthetic signals, obtained by alternating 50 sample epochs from two (A) or three (B) Weierstrass functions. (A) FD1 = 1.2; FD2 = 1.8; (B): FD1 = 1.1; FD2 = 1.5, FD3 = 1.9. Results of the comparative analysis, performed by applying the power model IN version of the NLD method (A, C) and Higuchi's method B, D on two synthetic signals, obtained by alternating 50 sample intervals from two Weierstrass functions. A, B: FD1 = 1.2; FD2 = 1.8; C, D: FD1 = 1.1; FD2 = 1.5, FD3 = 1.9. The two target waveforms (series of rectangular pulses/stairs) are indicated in red. The complexity waveforms of these synthetic signals were analyzed with both power model (WN, IN) versions of the NLD method (Fig. 7A, C and Higuchi's method (Fig. 7B, D), all methods using 5 sample moving epochs, step 2 samples. 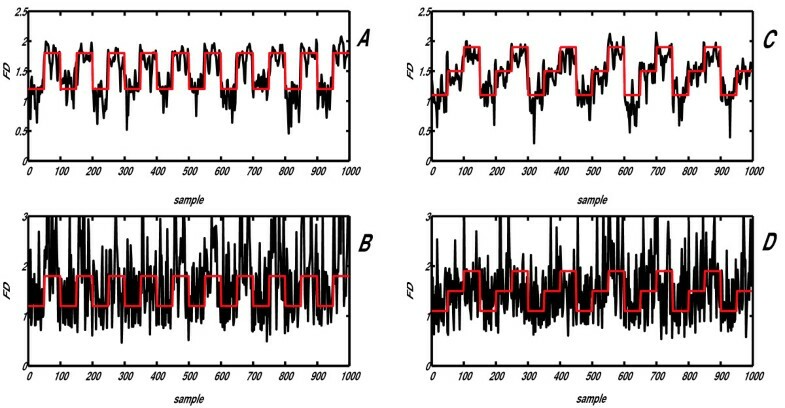 When compared with the ideal output (series of rectangular impulses/stairs shown in red on all four panels), greater accuracy of the IN version of the new method (WN not shown), presented on panels A and C of Fig. 7, is obvious. 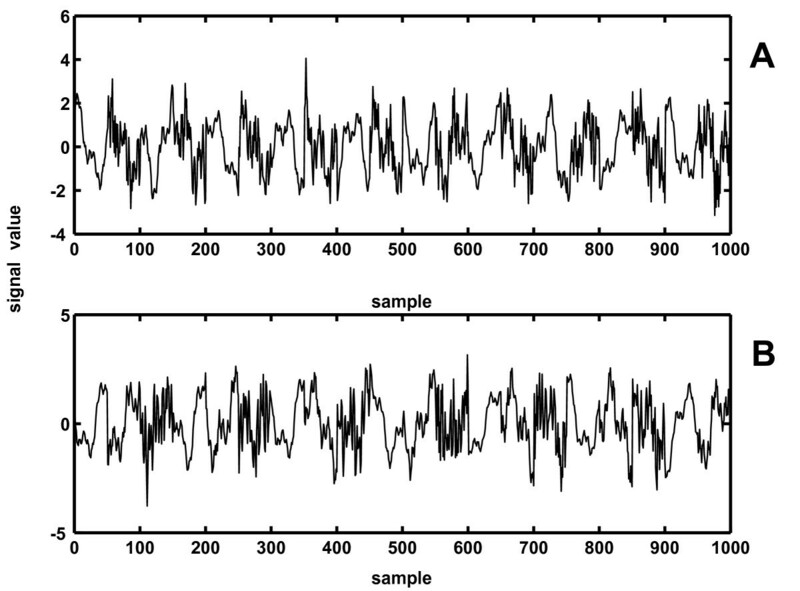 Expressed quantitatively, square error per sample for the first waveform (Fig. 7A, B) was 0.0466 in case of NLD, while 0.5998 for the Higuchi's method (≈12.9 times higher). For the second waveform (Fig. 7C, D), the corresponding figures were 0.0463 and 0.3902 (≈8.4 times higher). The new method and the corresponding calibration curve were constructed by analyzing the formerly described set of Weierstrass functions. However, its applicability on real biomedical signals could only be tested if applied on such natural signals and the obtained results observed critically. We present on Fig. 8 how lower scattering of short window FD w values, obtained with NLD method (compared to Higuchi's), looks on real biomedical signals. In this case a human occipital O1 derivation of the EEG activity was analyzed from a healthy adult in the relaxed awake state with closed eyes. A. Part of a typical occipital human EEG signal. B. Scatter plot of FD w values, obtained by Higuchi's and power model WN version of the NLD method from the signal presented in A, using short windows (10 samples). Fig. 8A presents part of this signal in time domain (4s), while total signal duration was 60s. It was analyzed simultaneously by Higuchi's and the NLD method (power model, WN) with moving non-overlapping short epochs of 10 samples. Resulting values of FD w are given in Fig. 8B in form of a scatter plot. One can observe that points obtained with Higuchi's method are "spilling over" the allowed limits (1<FD<2), while in case of the NLD analysis they remain within the marked boundaries. Values calculated with NLD are, however, overestimated in the low FD region. We tried to correct this systematic error by constructing a more accurate calibration curve than the one presented on Fig. 4, which was derived only from the Weierstrass functions. First, we explored how the initial calibration curve is modified when each of the power model parameters (a, NLD0 and k) are being varied. In fact, according to the direction and location of the bias shown on Fig 8B, one needs to modify the calibration curve in such a way that FD values are decreased in the low FD region (left part of the plot), while they stay unchanged in the high FD region. 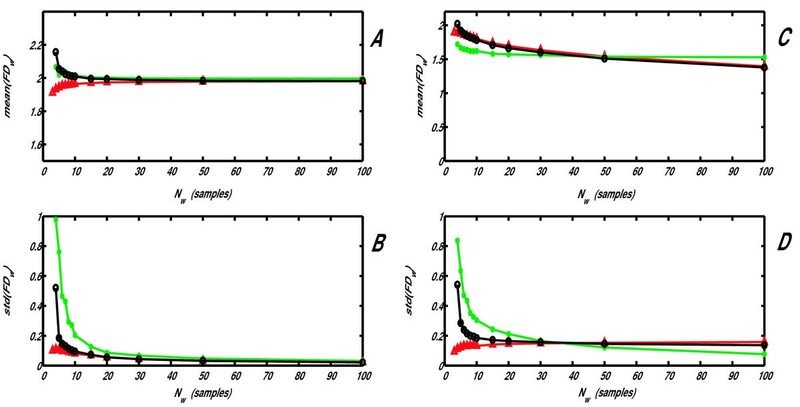 Influence of parameters a and k on the calibration curve are presented on Fig. 9 (parameter NLD0 was not varied, since it simply shifts the calibration curve horizontally). One can note that increase of k (dashed line) decreases FD in the low, while decrease of a (dotted line) decreases FD in the high FD region. 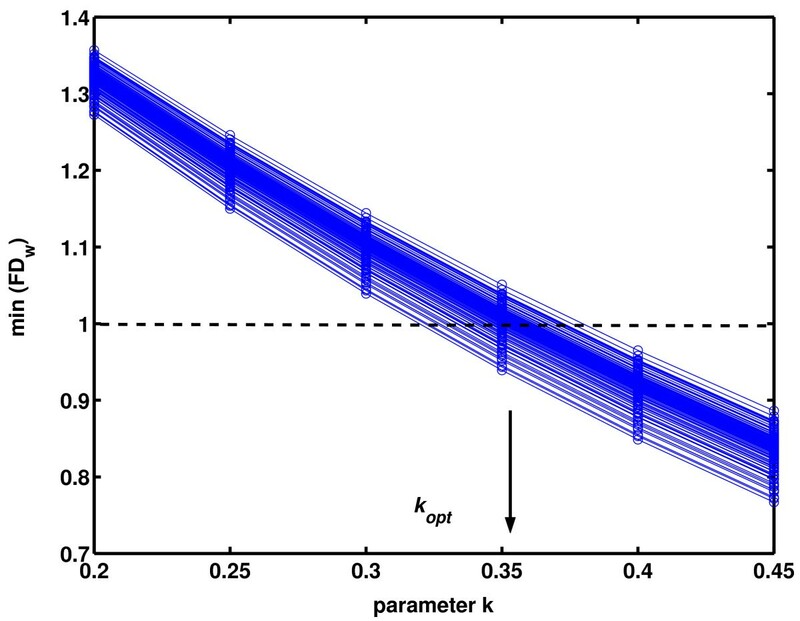 Therefore, by increasing parameter k, the calibration curve is being modified as required – FD values decrease in the low, while they remain mostly unchanged in the high FD region. Influence of power model parameters on the calibration curve. Initial calibration curve is drawn with solid line. Dotted curve was plotted by decreasing parameter a from 1.9079 to 1.8, in case of the dashed curve parameter k was increased from 0.18383 to 0.3. Further, the optimal new value for k could be determined by analyzing a sufficiently large ensemble of biomedical, e.g. EEG signals (so that short epoch FD w values populate more or less evenly all regions of the scatter plot on Fig. 8B) and by observing that all FD w values fall between the required limits (1<FD<2). We analyzed 140 EEG signals, each 60s long, from ten adult wake healthy subjects. The electrodes were positioned at 14 locations (F7, F8, T3, T4, T5, T6, F3, F4, C3, C4, P3, P4, O1 and O2) according to the International 10–20 System with an average reference. Signals were sampled at a rate of 256 samples/s, band pass filtered between 0.5 and 70 Hz and artifacts were removed manually based on a visual inspection. Other details about data collection and preparation can be found in . For each signal, a series of 6 analyses (NLD method, epoch 10 samples) were performed, where parameter k was varied (0.2 – 0.45, step 0.05). For each of the 140 EEG signals, the minimal FD w was plotted against the varied value of k and all 140 crossings with min(FD w ) = 1 were determined (Fig. 10). Optimal value for k was then calculated as the average of these crossing values: k opt = 0.3523 (± 0.0122). Analogously, as parameter a influences the calibration curve in the high FD region, maximal FD w values were also calculated and 140 crossings with max(FD w ) = 2 were determined. The obtained optimal value for a was a opt = 1.8399 (± 0.0980). Finally, using these new parameters, as an example, we analyzed again the signal from Fig. 8. The corresponding new scatter plot, shown on Fig. 11, confirmed that these corrections (red points) eliminated the formerly detected bias in the low FD region. Minimal FD w values, obtained by NLD method, epoch 10 samples, applied on 140 healthy human EEG signals, as a function of the power model parameter k. Each blue line corresponds to one EEG signal. All 140 crossings with min(FD w ) = 1 (dashed line) were averaged to calculate k opt = 0.3523. Scatter plots of 10-sample FD w values of the same human EEG signal as in Fig. 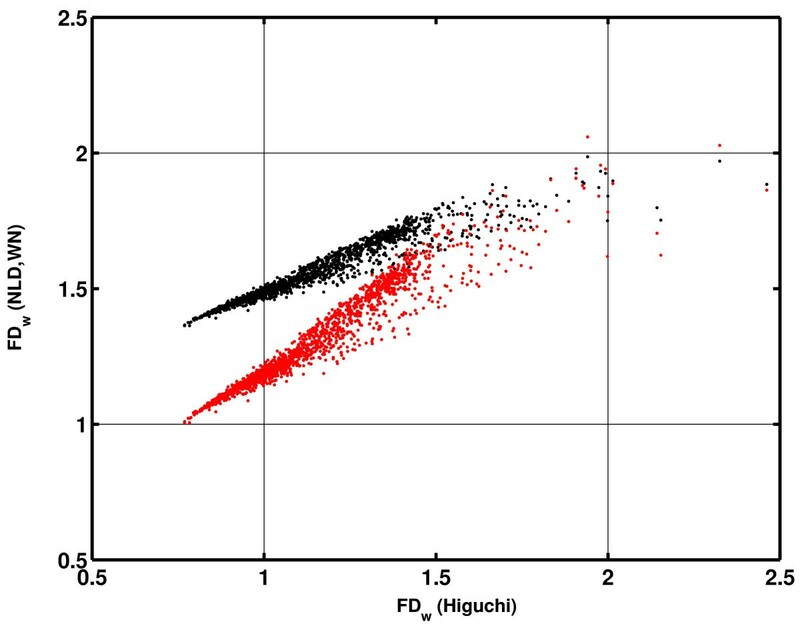 8, obtained by using old (black dots) and the new, corrected (red dots) calibration curve, where the low FD region bias is eliminated. b) slowly evolving FD variations, caused by physiological processes themselves. In the first case, it is to be expected from the present approach to detect such occurrences, while slower FD variations should be extracted as a function of time (complexity waveforms). In both cases, it is to be expected that extracted signal complexity changes should be more accurately measured (i.e. less "noisy") if performed by the NLD method than by the existing ones. As well, the new method could be tested in other areas where changes of signal complexity occur, such as engineering, geology, meteorology, astronomy (cf. ). The new NLD method is more accurate than Higuchi's or consecutive differences for extracting signal complexity waveforms (FD(t), current changes of signal FD), when using short signal epochs (<30 samples). This result follows the fact that standard deviation of its moving window FD values (FD w ) is considerably smaller than those obtained by the two other methods. However, this improvement is achieved at the expense of lower accuracy in measuring mean FD w . Initially detected overestimation of the FD w values, calculated by NLD in the low FD region, was due to an imperfect calibration curve FD = f(NLD), derived from a set of Weierstrasss functions. The bias was corrected by a procedure of modification of power model parameters, based on the analysis of natural (EEG) signals. The present approach might be used whenever "running" signal FD changes are of interest, e.g. in physiological signal analysis for automatic detection of short phasic phenomena or transient artefacts, as well as in other areas where changes of signal complexity occurs, such as engineering, geology, meteorology, astronomy (cf. ). This work was supported by projects OI 145062 and OI 143027 of Ministry of Science and Technological Development of the Republic of Serbia and the project "Homeostatic mechanisms and the regulation system of behavior" of the Serbian Academy of Sciences and Arts. We thank Dr Aleksandra Vuckovic for providing us with the EEG signals analyzed in this work. Idea for the NLD method design was suggested by AK. AK and TB worked on the data analysis. TB and LjR contributed to the interpretation of results. All authors read and approved the final manuscript.